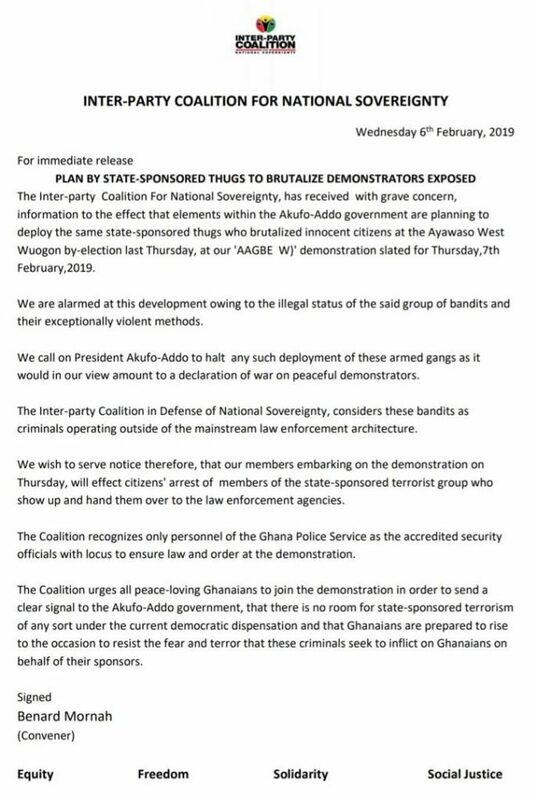 Organisers of the ‘Aagbe wo’ demonstration say they have picked intelligence that some individuals backed by the state have planned to attack them during their demonstration today. In a statement, the group said they will only recognise the police as security officers for the demonstration, which is aimed at registering their anger at what they say is the growing insecurity in the country. They warned their members will effect citizen arrest anyone attempts to foment trouble as they hit the streets today. Meanwhile, former President John Mahama has called on members of the NDC to attend the demonstration. “I welcome the initiative of the Inter-Party Coalition for National Sovereignty and I encourage all members of the National Democratic Congress (NDC) to participate in tomorrow’s demonstration. Let’s show to the world that we stand for peace and that the violence displayed in AWW has no place in our democracy.” he said in a Facebook message.